I’ve gone on about how fantastic Jamie Zawinski’s chronicles of taking over and renovating the DNA Lounge are. Besides his unflinching of the ups and downs of renovating the club, and his deliciously nasty reaction to the status quo of licensing and politics surrounding entertainment in a city reknowned for being open-minded and supposedly free, he has a great sense of historical context. From the beginning, he was trying to track back what came before, why his club was where it was, who owned it, who ran it, what functions the building held. Through the lens of his current ownership, he traces his place in the world. He finds old blueprints, old news stories… whatever makes sense. 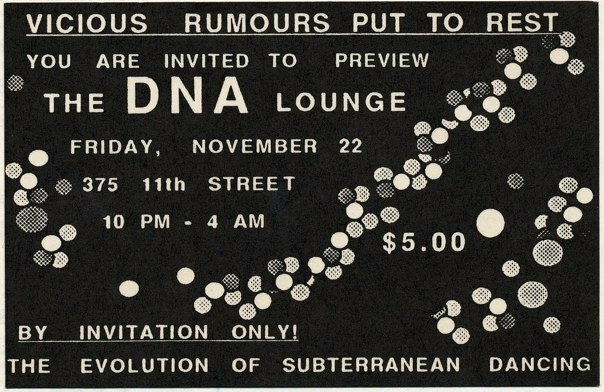 The DNA Lounge came into existence in 1985, many years before Jamie bought it. And like any club, they had shows. 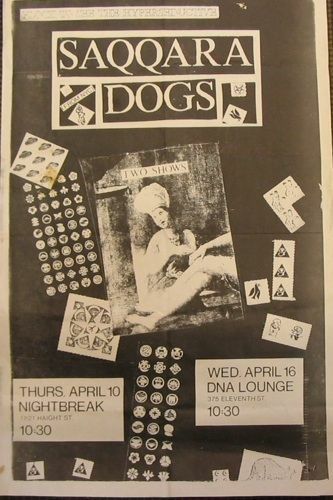 And like any club with shows, they had flyers. Jamie recently found some. He’s put them up here. Flyers are a very specific thing – they’re meant to be self-contained invitation and news capsules, jettisoned out into the world to drag people somewhere they weren’t thinking about going to. In a world of weblinks, these are notably different – weblinks just send you to the thing in question (although of course, a weblink can lead to a flyer). With a flyer, you have to both attract the audience without overflowing them with information. Especially if you’re talking about a place to come drink and dance. So they’re compact, but alluring. Intense, but easy. They have to balance all these factors, while still ending up who-knows-where to attract the audience. Composed from photocopying a bunch of cut-out printed papers and photographs, this flyer is a single color (black, with colored paper to get the effect) and obviously came together rather quickly. I love flyer archives for this reason. I do think there’s a problem with dumping thousands of images on people with no way to easily search through them, or to set up a browsing experience that mimics finding these and finding out what happened there – it’s just a lot of work to set up and asking the audience to essentially do that job for you, but without the tools, is a bit much. 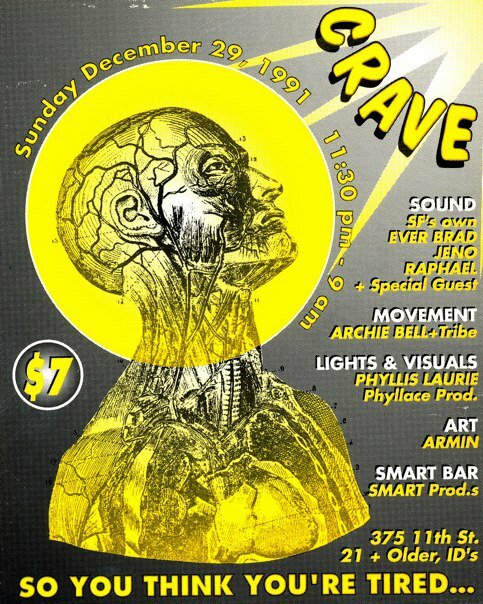 But for the initiated, please check out some of these wonderful “flyer archives”; two magic words that summon an avalanche of intense imagery.